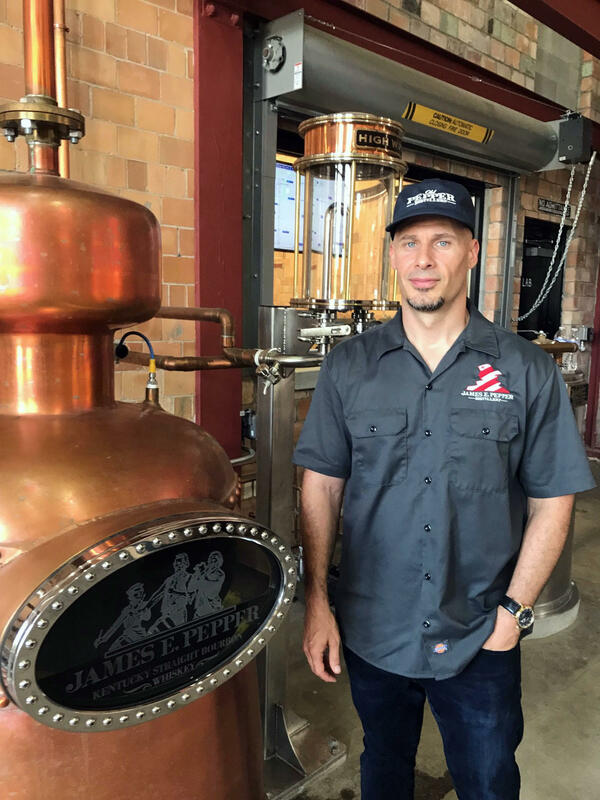 Amir Peay recently opened a distillery in Lexington, Ky., at the site of the James E. Pepper distillery. About 10 percent of his revenues come from exports, and Peay worries that the European Union's tariffs will hurt his overseas business. U.S. whiskey distillers are fretting over the steep new tariffs they're facing around the world. They're being punished as U.S. trading partners retaliate against the Trump administration's tariffs on steel and aluminum. Now, the distillers fear that a long boom in U.S. whiskey exports could be coming to an end. "The free-trade agreements and the lowering of tariffs that we've received in the past generation have really put bourbon on an equal playing field with our friends in Scotch and Canadian whisky, and other whiskies around the world," he says. But now, the open trade environment that produced that boom — and about $1 billion in annual export revenues — is threatened. Gregory worries that there are no winners in a trade war, only casualties and unintended consequences. "And that's where we feel we are. We're the victims in a fight that we didn't pick," he says. Amir Peay is one of the potential victims. He just opened a new distillery with a historical theme. He bought and refurbished a building in Lexington that housed the distillery that produced James E. Pepper 1776 — once among the most popular whiskey brands in America, with roots that went back to the American Revolution. Revitalizing this brand and distillery is a 10-year project that Peay funded with his own life savings. He is already producing nearly 30,000 cases of whiskey a year, using his distillery and excess capacity at other distilleries. About 10 percent of Peay's revenues come from exports. "We had been eyeballing Europe as the most logical place to invest and to grow and expand the brand," he says. In fact, he hired a person to manage the expansion and has designed new bottles and labels. But new European tariffs, along with those in Canada and Mexico, could sabotage his growth strategy. "I just had a meeting this morning with our Canadian importers, who were here at the distillery, and we're all just scratching our heads, because who in their right mind a few years ago would have envisioned us in a trade war with Canada and the European Union, our closest allies and partners," Peay says. He estimates that the 25 percent EU tariff will force him to raise the shelf price of his 1776 whiskey from 35 euros to 45 euros (from about $41 to $52). He fears European customers will look for something else to drink. "I think it will have a big negative impact. You know, we're creating a lot of jobs, we're hiring a lot of people, and when your growth is being stifled, that is very problematic," he says. Peay says what worries him most is that over the past 10 years, the big whiskey distillers in the U.S. have been doubling and tripling capacity in response to the global whiskey boom. "The huge increases in production were really intended to fill the anticipated global demand in Europe, in China, in India and elsewhere," he says. Whiskey needs to be aged — three to 10 or more years — so those companies have already produced much of the whiskey they think Europeans and Asians will consume in the next several years. But if those forecasts don't pan out because of a trade war, what do those companies do with all that excess whiskey? Peay says they would likely try to sell it in America. "So then what? Do we now have a flooded market where there's too much whiskey, brutal price competition, distilleries get shut down? There are unintended consequences and what might seem trivial or not as bad early on could snowball into something much worse. And at that point, it's kind of hard to turn it back," he says. In Kentucky, whiskey distillers are getting nervous. U.S. trading partners have put new tariffs on whiskey to retaliate for the Trump administration's tariffs on them. And distillers worry that a recent boom in U.S. whiskey exports could be coming to an end. NPR's John Ydstie has the story. JOHN YDSTIE, BYLINE: American whiskey has experienced a huge revival over the last decade. Eric Gregory of the Kentucky Distillers' Association says the biggest reason is that U.S. trade initiatives over the past few decades have opened up global markets. ERIC GREGORY: The free trade agreements and the lowering of tariffs that we received in the past generation have really put bourbon on an equal playing field with our friends in Scotch and Canadian whisky and other whiskies around the world. YDSTIE: But all of the sudden, the open trade environment that produced that boom is threatened. U.S. allies, including the EU, Canada and Mexico, are responding to the Trump administration's aggressive trade moves by retaliating against bourbon, along with other U.S. products. Gregory worries there are no winners in a trade war. GREGORY: Only casualties and unintended consequences. And that's kind of where we feel we are. We're the victims in a fight that we didn't pick. AMIR PEAY: Really, there's five key things to making great whiskey - water, grain, fermentation, distillation and maturation. YDSTIE: Amir Peay is one of the potential victims. He's just opened a new distillery here in Lexington, Ky. Actually, it's a very old distillery that Peay has rebuilt to produce James E. Pepper 1776, one of the most popular whiskey brands in America in the late 18 and early 1900s. PEAY: Now that rock you see there - that big limestone boulder with water flowing down the sides of it, that's to really illustrate why our distillery and all the distilleries in Kentucky make great bourbon, and that's because of the water. YDSTIE: Revitalizing this brand and distillery is a 10-year project that Peay funded with his own savings. He's already producing nearly 30,000 cases of whiskey a year using his recently renovated plant and excess capacity at other distilleries. About 10 percent of Peay's revenues already come from exports. PEAY: We had been eyeballing Europe as the most logical place to invest and to grow and expand the brand. YDSTIE: In fact, he's already hired a person to manage the expansion. But new European tariffs, along with those in Canada and Mexico, could sabotage his growth strategy. PEAY: I just had a meeting this morning with our Canadian importers. We're here at the distillery, and we're all just sort of scratching our heads because who in their right mind, a few years ago, would have envisioned us in a trade war with Canada and the European Union - our closest allies and partners? YDSTIE: Peay estimates the 25 percent EU tariff will force him to raise the shelf price of his 1776 whiskey from 35 euros to 45 euros. He fears European customers will look for something else to drink. PEAY: I think it will have a big negative impact. You know, we're creating a lot of jobs. We're hiring a lot of people. We're investing in growth. And when your growth is being stifled, that is very problematic. YDSTIE: Peay says what worries him most is that over the past 10 years, the biggest whiskey distillers in the U.S. have been doubling and tripling capacity in response to the global whiskey boom. PEAY: The huge increases in production were really intended to fill the anticipated global demand in Europe and China and India and elsewhere. YDSTIE: And whiskey needs to be aged three, five, 10 years or more. So those companies have already produced much of the whiskey they think Europeans and Asians will purchase in the next several years. But if those forecasts don't come true because of a trade war, what do those companies do with all that excess whiskey? Peay says they would likely try to sell it in America. PEAY: So then what? Do we have a flooded market where there's too much whiskey, brutal price competition, distilleries get shut down? There are unintended consequences, and what might seem trivial or not as bad early on could snowball into something much worse. And at that point, it's kind of hard to turn it back. YDSTIE: Peay says he hopes the trade conflict will be solved before the worst happens. But he also remembers that the original James Pepper, whose distillery he now owns, went bankrupt after a whiskey bubble burst back in 1890. John Ydstie, NPR News, Lexington, Ky.
(SOUNDBITE OF HUEZ'S "OPEN AIR") Transcript provided by NPR, Copyright NPR.